Get ready for a spectacular set! Point of Purchase Model 7 Counter Tray complete with the original 6 Red-Ripple pens, each color coded for it’s particular slot in the tray. Waterman color-coded their caps and nibs for easy selection of the type of nib the user wanted. This was their answer to the Wahl Eversharp “Personal Point” pens. There are three other colors not represented in this tray: Black (“Stenographer’s nib”)’ Brown (originally the same flexibility as Pink, but a shorter nib, later became a stiffer nib); and Grey (oblique, rigid). There may have been a “White” (“course,” which was Waterman’s term for Broad) but one has yet to be found. At this time other pen manufacturers were racing to the celluloid bandwagon to produce pens in colors which were in high demand by the public. Waterman had invested so much time and money in producing colored hard rubber pens that they waited until 1929 to introduce a celluloid pen (the Patrician). Left to Right (Waterman’s catalog descriptions in quotes). Purple: “Fine and Stiff. Makes a thin clear line with utter accuracy.” Pink: “Fine and Flexible.” Actually, triple-flexible. Perhaps the most popular and sought after nib available today. Green: “Rigid. Tempered to armor-plate hardness. Excellent for carbon copies.” Red: “Standard. Medium flexibility for general use.” In actuality, the “Red” nibs vary in flexibility from “Flex” to “Triple-Flex.” This one in medium, extra-flexible. Yellow: “Rounded. The tip is ball shaped to write smoothly in any direction. Suits southpaws.” Blue: “Blunt. An improved stub point. 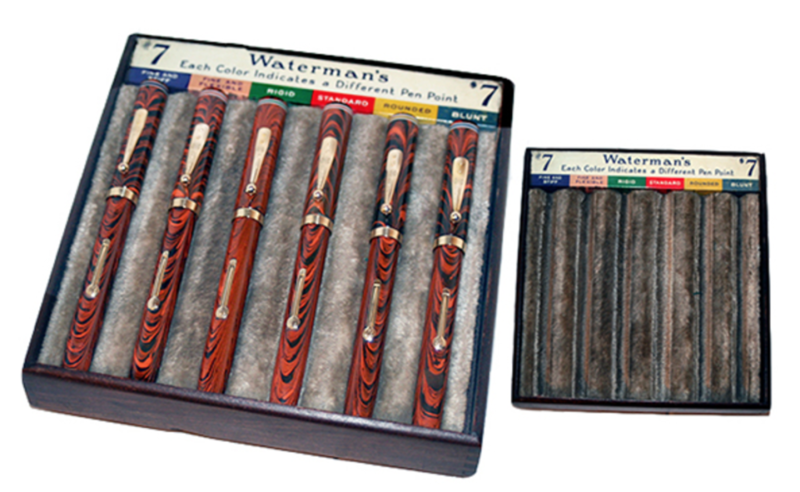 Makes a broad line.” This is perhaps a once-in-a lifetime opportunity to own a wonderful piece of Waterman history, along with six near mint pens, all operating perfectly. The pens are not available individually and you can select a different pen every day of the week (and have Sunday off!). This entry was posted in Vintage Pens and tagged Collector, Waterman. Bookmark the permalink. Follow any comments here with the RSS feed for this post. Post a comment or leave a trackback: Trackback URL.